"Willie would have had it." I heard it the first time I went to a baseball game and have heard it or thought about it at every game since. The words would come from my father as he tried to teach me about the greatness of Willie Mays. Fly balls that hit the warning track or that would drop in front of or to the side of an outfielder would get the same comment from my Dad, "Willie would have had it". My father grew up a Mays fan and was surrounded by Mickey Mantle fans. His neighborhood was just one of the many neighborhoods where fans of all ages debated over who was better. Mantle fans would talk about his ability to switch hit and when Mantle would struggle to match up with Willie they would argue it was only because of his bad knees. My father would respond accordingly, "fine, Mickey is the best center-fielder with bad knees and Willie is just the best center-fielder". I was born in 1974, a year after Willie Mays played his final game. I never got to see him play but I was fortunate enough to take an unofficial life long course about all things Willie Mays. It was a course taught by my father and I had no choice but to attend. Ken Griffey Jr. was billed as the next Willie Mays. He was a five tool player that wore #24, the comparison was easy to make. My father and I attended a game at Fenway Park early in Griffey's career. It didn't take long for my Dad to sum up his thoughts on Griffey. "He is no Willie, they should rip the #24 off his back". This opinion was formed right after a fly ball landed off the base of the center-field wall behind Griffey. Willie would have had it. It wasn't just his range that my father would rave about. He would also brag about his arm. He would remind me that the great thing about Willie's catch in the 1954 World Series is that nobody tagged up. My father also loves to share the story of a game in Philadelphia that he attended. His seats were on the third base line with Willie and the Giants in town. There was a base hit to center and a Phillie attempted to go first to third on the great Willie Mays. "All I saw was Willie throw it and then a puff of dirt at third base and the umpire making the out call, the throw was not visible to the human eye". 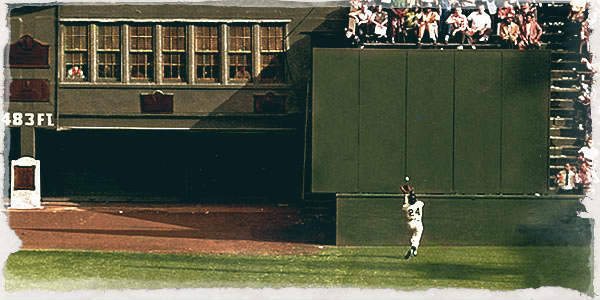 Willie Mays is an icon and when it comes to icons they always tend to get better as the years pass. It is easy to exaggerate the exploits of players who played before the age of Sportscenter. It is much easier to be critical of modern players because we have access to every at bat and every play. It is impossible to exaggerate a play because we have video of it and it is also impossible to hide their failures because we have video of that too. Willie, Mickey, Babe, Ted had it made in that respect. It wouldn't quite be the same if they came around today. However, stats don't lie. Willie played the majority of his career in a 16 team league and against great pitchers. The league was not watered down and the rules favored the pitcher. The mound was high, the strike zone was big and there were many more pitcher friendly parks. Despite all this Willie put up numbers that are still mind boggling today. Hitting for average and power without the use of anything but his natural ability. About a 15 years ago ESPN did a series in which they counted down the greatest athletes of the past century. Mays finished 8th and Mantle finished 37th. Secretariat came in at #35. My father, then in his mid 50's loved it. Not only did he feel vindicated that Willie was well ahead of Mickey but he also loved the idea that even a horse beat out The Mick. He said the only bad thing was that he couldn't go back to the old neighborhood and find those kids again. My Dad had won the argument and he wanted to take a victory lap in front of those kids. Those kids are all grown up now and somewhere they have come to the same conclusion we all have, Willie would have had it. Happy 85th Birthday Willie!